I just took pictures of a couple of examples since all five pairs look very similar. That did make pairing them up easier! 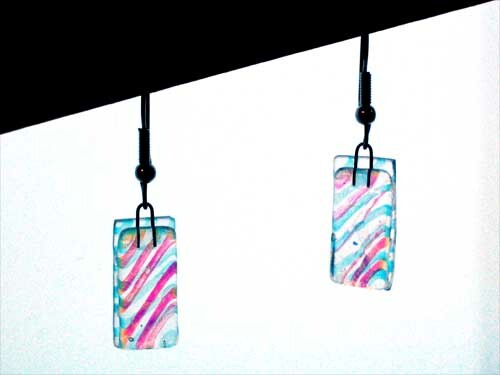 They should be a great match for all the pendants made from this rainbow glass. If you want a pair, let me know and I'll set them aside for you... not necessarily the exact ones shown above, but as I said, they're very similar. $15 + $4 shipping. Thanks! 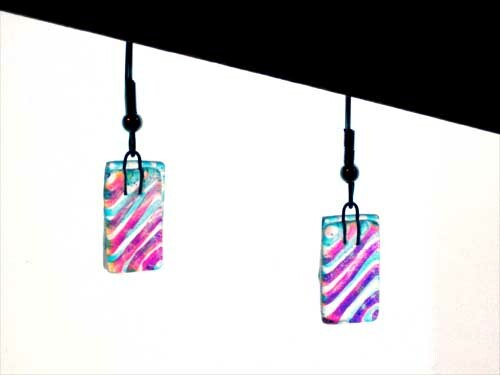 If you don't think you can do chain dangles, I'm happy to snag a pair like you have up there, but on the off chance you can...! Sure, I could dangle 'em on chains. The two pieces of glass on two chains would look good, but the lil' earring bits are kind of a pain to make. Hrm. 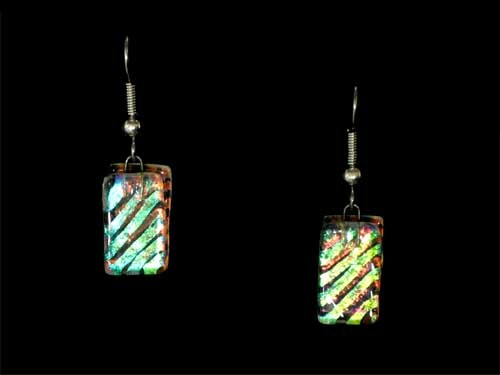 Maybe I should make arrangements with the local glass shop and see if they'd let me drill holes in a single-layer earring piece. Then they'd be REAL easy to make compared to these, which are the double-layer with the U-shaped wire piece. See, cutting 4 pieces to match and then to position them with the wire in the kiln, that's the real challenge. 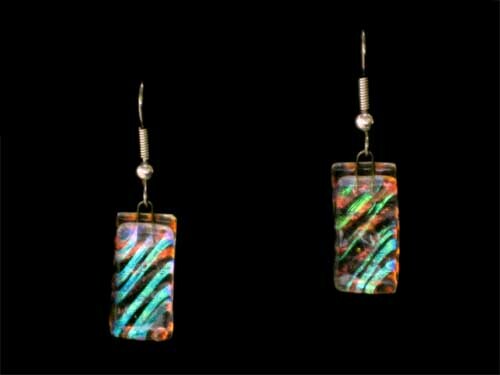 But if I could just cut TWO pieces that match and make those into dangles? That wouldn't be so traumatic, and they'd be lighter weight too. Since I don't have any on hand, I can't tell how much of a weight issue it would be. I tend to not have problems with heavier earrings, though. I think either way would work-- the easier the better, but I'd say experiment and see what looks best! And of course, the price should change depending on the effort/materials.. Just let me know how much! OK, I did some research... I should be able to drill holes using my dad's drill press and a special drill bit, underwater. :) I'll experiment tomorrow and if it works, it should make the earring process much easier!